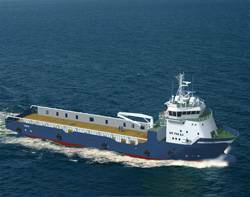 Rolls-Royce won an order from Norwegian ship builder Simek AS to design and equip a UT755 LC platform supply vessel. The contract includes a fully integrated Rolls-Royce power and propulsion system including main engines, propellers and tunnel thrusters. Deck machinery, electrical systems, automation and control systems and bulk handling equipment are also included in the order. The vessel will be built at the Flekkefjord ship yard in Norway, and is due to be completed in the third quarter of 2012. It will be the 23rd Rolls-Royce UT design vessel delivered by Simek. The UT 755 LC is a development of the popular UT 755 series vessel, designed specifically for supplying equipment to oil and gas platforms. It will have an extended hull and larger deck space to increase the capacity for transportation of solid and liquid cargo.